I have now come to realise that I just can’t live without my cell phone! This week I was waiting for my train home and dropped my phone from the little bench I was sitting on. It couldn’t land on the side or the bit where the cover was on could it? No, it had to land on the very corner that the cover came off and hit the concrete with a delicate “dink”, because it only feel about eighteen inches it didn’t even bounce. But that little impact shattered the screen from the top left corner to half way down the screen on the other side. I even surprised myself with the torrent of new swear words that flowed instinctively from deep within my subconscious thoughts, the flood of words formed into incomprehensible sentence without breathing, one word per crack it would seem. With that in mind it still worked so I should be thankful for that, sadly the screen was difficult to read obviously. I ordered a replacement glass screen that evening from eBay, every time I looked at that screen I was reminded of the fact that I really should pay more attention to what I am doing, along with the fact that I should apologise to a few fellow passengers who were near by. Those poor now scared for life souls must have thought that I was some sort of nutter trying to recruit people into my fledgling cult using a strange chant, using a strange language mixed in with copious amounts of Cockney Rhyming Slang! Friday night I replaced the glass which took me almost four hours in total. The reason it took so long? I was tired and just didn’t want to damage it, I wasn’t sleeping because I was worried about my phone. Now my phone is back to its former glory and works again, and my life is a once again organised into some sort or order, but I can’t help feeling the phone has been tainted in some way. When you have a minor fender bender in the car, you never feel the same towards the car again, or is that just me? Off the back of this traumatic event of mine, I need to ask a question though; Can you live without your cell phone? I came to realise that my functioning life was on that phone and I definitely can’t live without it; My contacts, my personal emails as well as the emails for this blog, my diary, things to do, passwords & website logins (all encrypted via an app of course), birthdays, anniversaries, text messages, photographs and in fact just about everything is on there. It felt like my hand had a finger removed because I didn’t use the phone as much, let alone being the extension of my arm that it usually is. I have now backed up my phone and the important things I need just in case I damage it beyond repair or it doesn’t turn on one day. On a Friday afternoon at work we tend to ask each other what we have planned for the weekend, things like going to see parents, BBQ’s, chilling out, going to the movies etc, when they get to me I get “What are you doing on the car this weekend Mart?” Now either I am predictable, or I have just conditioned their thoughts to expect me to be working on my project or obsession depending who you talk to that know me. This week I was asked if I was going to be out “Tinkering” with my car? That was an expression I haven’t heard for a long time and I don’t normally associate the term with “working on the car” as I tend to call it. Does anybody else have a little phrase they use for their car work? I would love to know. On my Twitter account I saw a reference to a great story from 1966. 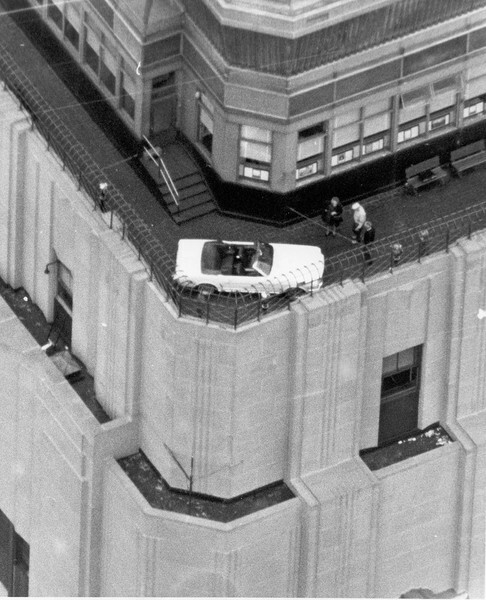 That year Ford provided their latest model Convertible Mustang for a promotional exercise in conjunction with the Empire State Building. The car was perched on the 86th Floor and taken up to the top floor by means of only the passenger lifts, no helicopter or winches were used. It’s an incredible read and amazing what they managed to do with a team of Ford engineers, six hours overnight and a few small lifts! It stayed up there on the building for the next five months. I have posted the rest of the photos and the full story of it in my “Articles” menu or you can click here for the quick link. This weekend I have been doing a little bit of tidy up work where the door pillar on the right hand side. There were a few little rust holes that needed treating and the seams strengthening. I got the Dremel out and slowly sanded down the seam filler for a good base for the filler to cover up the imperfections. Next weekend I hope to get the car out and rub it down smooth ready for some anti-rust treatment primer. This entry was posted in Articles, Car, General, Photo's and tagged articles, diary, emails, Empire State Building, ford, lifts, Mustang, nutter, promotion, rust. Bookmark the permalink. I can leave without my phone few days or a week, sometimes is good to go away from it. Thanks for the comment and I do agree its its nice to get away from the phone for some peace and quiet, but I just be without it so it seems. You have just got to tell me more the Mr Ford work! 🙂 i’ll start with me being a co-driver in a Mustang’ 67 we olny got 3rd place but the greatest fun and we also had some licking problems 😦 one broken tube from radiator. Have a great evening, Mart! 🙂 I’ll see, thank you! I never knew about that Mustang, what a fantastic bit of history. Of course, now crowds like Aston get helicopters to deliver their cars to the top of buildings in Dubai, just for a launch party for some wealthy customers. I so much enjoyed your rendering of what it’s like to have a finger removed. I feel the same way about my MacBook Pro. When I take it with me while traveling and we stop at a restaurant it comes inside with me. Losing it/having it stolen would horrible. I do have my 50thousand word book, passwords, etc stored elsewhere, but if my creative glory fell into the hands of strangers or even melted in the heat of Missouri humidity I would be devastated. Glad your phone is back in one piece, but I totally get what you mean about the fender bender analogy. 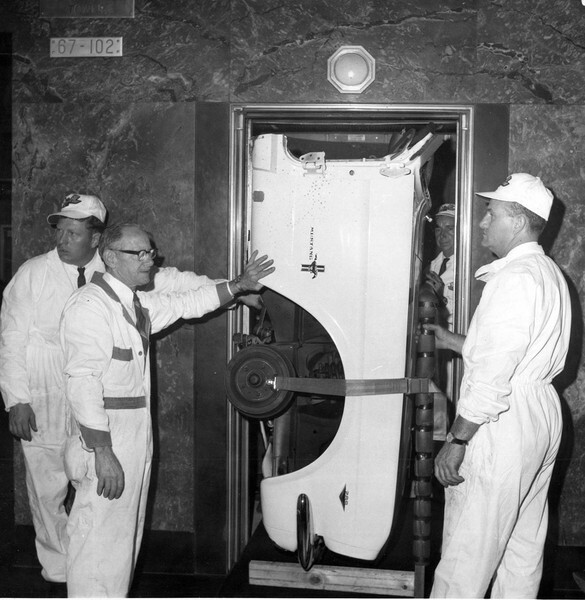 Finally, the picture of the mustang in the elevator is priceless! Too cool! !